As usual, iCTech does not ascribe the information to a specific source. The account has a spotty reputation and has in the past provided both accurate leaks -- photos of Apple's iPhone 5c Quick Start guide -- and rumors that ultimately proved incorrect. AppleInsider is unable to confirm the veracity of iCTech's current claims and presents the information for purposes of discussion. Sounds terrific. Here’s hoping they’re accurate. Though the heating issue w 15 w charging is a concern for battery life. If that is the final design and somewhat true specs.. take my money already..very clean and elegant ! Rumors,fake news. Seeing is only believing. So the next normalish sized iPhone X will not be a pair the larger model then. ie it'll be a Plus not a Max. 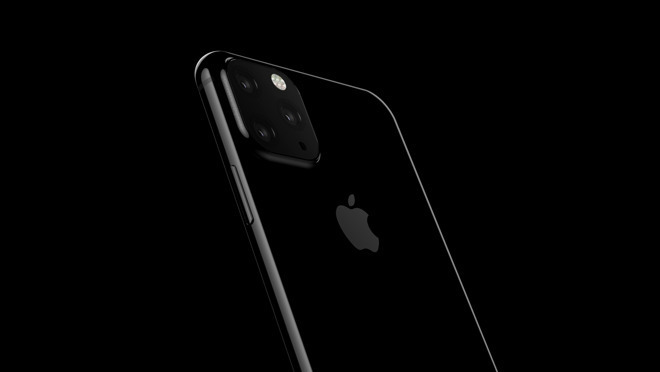 Rumor: Apple to revise Q1 2020 guidance. Will be cutting orders with suppliers and is already forecasting lower demand. Analyst’s made-up shipment projections to be slashed. I wouldn’t mind 3x telephoto. Personally i get plenty of life out of my current battery and have yet to use wireless charging even though my last two phones have supported it so those things aren’t high on my list. If these rumors are true + a 1080 display on the XR then I’m upgrading. Just like Apple limited 7.5w charging to approved wireless chargers perhaps they’ll do the same thing for 15w and require some kind of cooling to manage heat. My Anker 7.5w Qi chargers already have a cooling fan built into them. I know 7.5w is half the charging rate but my phone is cool to the touch even after a nearly dead to full charge. On that same note, I would be a little annoyed because my Anker chargers are limited to 10w charging so I’d have to replace them to get full speed wireless charging, and they weren’t cheap. Almost $60 each and I bought 4 of them. I don’t understand why people are so hung up on a 1080p screen. Why not offer a high capacity battery version of each model? Jony Ive could still be happy with the super skinny, standard battery models and could just avert his eyes from the thicker, big battery versions. Now that Apple actually seems concerned about flagging sales, this would be an easy way to get a boost. Let's face it, most iPhone users don't care much about anything but runtime. It's certainly the biggest source of frustration with all phone users, regardless of brand. Indeed. I just returned from a 10-day trip to an exotic foreign land that was hyper-photogenic. Using my new XS, taking 200 photos a day, plus a couple of short videos, also sent a few texts and emails, browsing the internet for news for maybe 20 minutes. Starting at 7 AM, by 3-4 PM the battery was below 10%. Had to rely on my Anker back-up battery to make it thru dinner. Photos are superb quality, battery life not so much. In this regard, the XS is no better than any iPhone I've owned and I've owned many going back to the first. Disappointing. These changes would mark an improvement over current iPhones but are features from 2018. The next iPhone refresh will be for most of 2020 and by then won't mark any industry difference. Battery capacity increases are long overdue but 4000Mah will be enough. They need to accompany that increase with a 'supercharge' feature, though. 15W wireless charging also appeared on phones last year. We got x3 optical zoom and tri cameras in March last year and x5 (in some people's views) in October last year. Now there are rumours of even higher optical zoom levels arriving in just four weeks (MWC2019). Apple should be looking to pull itself up to what the industry will be offering in September 2019 or even leapfrog those features, not announce features that appeared more than a year and a half earlier. It just makes the sale that much harder and when current prices are taken into account, even harder still. Fake Wishlist. Cook’s Apple would not make such an iPhone. Oh please. You cite a short-term extreme use case and are dissappointed that you had to use an external battery for part of the day. How's it working the other 355 days of the year? The battery life you complain about is more than enough for almost all customers almost all of the time. All they need to do is to convince people like me ( on an 8) to upgrade. The number of people who change to the most powerful machine regardless of OS is low. I took a vacation on an unnamed pacific island with my Xs, was taking pictures all day, doing some surfing and miscellaneous other use and never had my battery go below 50%. When they say '15W Wireless charging,' does that mean 15W consumed at the pad or 15W delivered to the device? Oh please. You cite a short-term extreme use case and are disappointed that you had to use an external battery for part of the day. How's it working the other 355 days of the year? The battery life you complain about is more than enough for almost all customers almost all of the time. Same for me during my 9-day vacation last year. It does not mean magnification power, as most people believe. It is merely the ratio between the longest focal length on a camera and the widest. 3x on one camera can mean something completely different on another. They could all be wide angle focal lengths and none of them telephoto. It it is a marketing ploy meant to deceive the stupid. Yeah, it’s eye-rolling. Pretty much everyone uses their phone to take pictures while on vacation and it doesn’t matter where or for how long. Last summer we were at the beach. I was taking photos and videos every day, frequently using my phone to control my drone, putting my phone on a tripod to get a 20 minute time-lapse of the sunrise, etc., and of course texting and going online and all the other normal things I do. I didn’t have battery concerns. Clearly people likely won’t complain about longer battery life, but for most people the current batteries last long enough. I have to to laugh at the posters saying 15w is last year’s tech when just a couple of days ago those same posters were talking about how most people carry a cable and maybe a charger with them everywhere anyway.